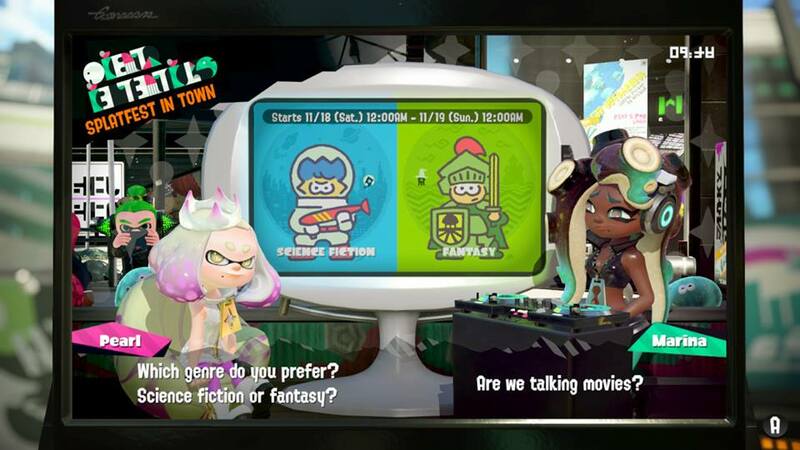 KoopaTV: Sci-Fi Vs. Fantasy: Genre Preference Splatfest! This is supposed to be a gaming site and I'll get to that, but once upon a time before the Internet made reading books pointless (and I know I'll get push-back from elitists and book authors in the comments section), I actually read books. I read stuff like Isaac Asimov's Foundation, some Kurt Vonnegut like Cat's Cradle, and apparently George Orwell's 1984 constitutes science fiction. Besides 1984, all of the sci-fi I just mentioned and other titles I've read, watched, or played all feel like they're trying to impress me with how science-y they are. As someone who finds such scientific bona fides to be undesirable, science fiction just doesn't resonate with me. This is what people say about science-fiction cartoon Rick & Morty, whatever that is. I got it confused with Ren & Stimpy. Oh, yeah, Men in Black is science fiction, too. But the science fiction aspects aren't why that's beloved — it's the comedic script. It didn't even occur to me before deciding to join Team Fantasy that Men in Black is science fiction! That must make it not an impactful part of the product. Anyway, my own situation aside, fantasy is just more enjoyable a genre. It's a lot more fun, without this crappy feeling of pseudo-intellectual crap you get from sci-fi. All of the franchises I enjoy fall into fantasy, like Pokémon (when it's not trying to go into sci-fi undertones) and The Legend of Zelda and others. The fantasy cases in the Ace Attorney series are better than the sci-fi-based ones, and Professor Layton single-handedly ruined Professor Layton vs. Phoenix Wright: Ace Attorney with his “logical” mandate to incorporate pseudo-scientific babble to explain the supernatural phenomenon that happened throughout the game. 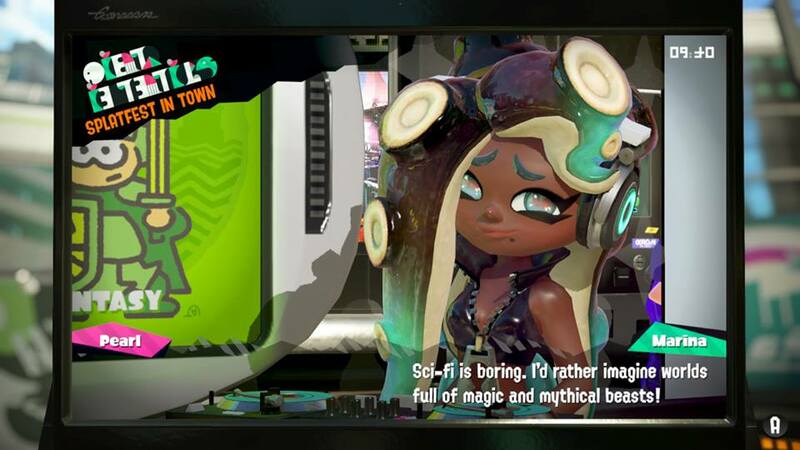 Marina says that sci-fi is boring, and I tend to agree with that line of thinking. If you're so focused on fiction, then why back it up with science? Why not go all the way, as Marina suggests, and go to a wholly FANTASTICAL state of existence? That's FANTASY. There's a reason there's tens of Final Fantasy games: People can't get enough of it. Tell me when there's even one “Final Sci-Fi” game and it gets any attention. Speaking of attention, mark this date: November 18. That's when the Splatfest is! See you there. Ludwig believes that fantasy is a much more whimsical basis for starting a work of fiction than science fiction. He also dislikes doing research on science concepts to actually get a sci-fi work off the ground, so he's never produced something that could qualify as science fiction. Which team are YOU joining? Are you that one person reading this and wishes that the horror genre was represented instead? The Splatfest before this one was on Vampires vs. Werewolves, which are both fantasy concepts. 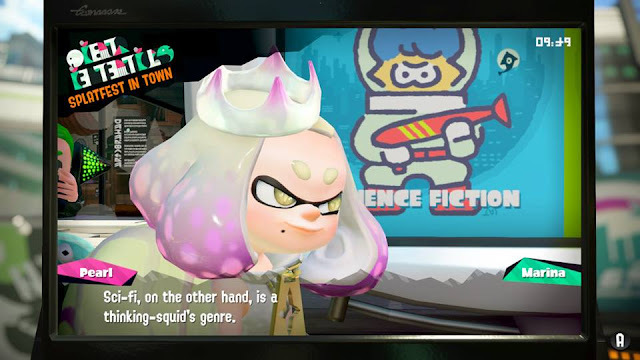 After bashing books in this article, Ludwig turns around and supports Team Book in this Films vs. Books Splatfest. Next Splatfest in America: Sweaters vs. Socks. Is there a way to make that an interesting topic? Yes. It apparently wasn't enough to narrow your genre preferences to Sci-Fi or Fantasy. No, they want to know Action or Comedy, too. Well I defected from Team Science to Team Fantasy. What is the most obnoxious Fantasy’s side has to offer, My Little Pony fandom? Nothing like how pretentious Team Sci-Fi can be, just look at Game Theory and how they try to say Sci-Fi themed games like Mario Galaxy will never work, though you may like them for how Mario will horribly die in real life space. See, I don't accept that Galaxy is sci-fi. Yes, it takes place in SPAAAACE but, like, that doesn't really matter or affect things. It's clearly Fantasy. I will be joining Team Science (Fiction) once again. I firmly believe that Science isn't limited to space, in contrast to Pearl's choice of picture. Science Fiction has brought us great films like Back to the Future and Star Wars, and TV Shows like Star Trek. Science Fiction, unlike Science from the former Splatfest, is a genre based on storytelling, and a form of storytelling. Also, great games come from fusions of both genres (see: Chrono Trigger). Also, Pearl is on a three-Splatfest winning streak in North America. Well, I'm not beholden to any particular Off The Hook member's preferences. That doesn't matter. I'm going purely based on merits. You firmly believe science isn't limited to space, and then give examples that are... space-based. 'kay. You'd think you'd mention Stranger Things since you name-drop it at the end of your recent guest article. The point I'm trying to make is that science fiction is a genre that continues to be filled. Personally, it's hard to list examples as most media are fusions of the two. Take The Hunger Games. It's a book series, in which the government controls the world the characters live in. The characters train with science-like techniques, but are then dropped into a fantasy-like world, with forests and deformed animals placing an attempt to kill them. Or, as someone brought up, Super Mario Galaxy. In it, Bowser builds a Galactic Empire with Peach by his side. Empires are typically associated with fantasy, and you don't need me to tell you what "Galactic" refers to. Well, again, just because you're in space doesn't mean anything scientific is being done with it... right? Galaxy being in space just means that instead of falling in a bottomless hole, you fall into a black hole instead. There's nothing actually different happening because it's "sci-fi". Like, the developers of Galaxy said that all these different sorts of GRAVITY things would happen because it's in space, but, like, that didn't really happen to any different effect than any other game. It's all still fantasy to me. "before the Internet made reading books pointless"
Elitist and book a̶u̶t̶h̶o̶r̶ expert here. I could write a whole (KoopaTV) article about why books aren't made 'obsolete' by the Internet. And frankly you don't need to be a smart-pants like me to realize, that books and the internet aren't even competing mediums. As you can find books ON the internet. (And internet links in books I guess?). So you probably didn't mean 'books' when you wrote 'books'. So what could you have meant instead? Thesis 1: Actual 'books' made out of paper (as opposed to digital books). Since it won't really matter whether you destroy forests to make paper out of them or if you destroy forest to build solar panels to generate electricity for your computer, the biggest difference it makes is personal preference. Granted the pros of paper books (cheaper, no electricity needed, healthier for the eye, less likely to be stolen, don't break when falling to the ground/getting a bit of water on them, will survive global EMP-waves caused by a̶l̶i̶e̶n̶s̶ the sun, etc. etc.) heavily out-weight those of e-books (faster to get, lighter to carry around if you are a backpacker or something, ??? ), but in the end it is preference. I could outline more possible meanings of the seemingly cryptic, non-sensical, hieroglyphical, vile, sinister and outright false statement: "before the Internet made reading books pointless". But instead of wasting everyones time, (what's your excuse for reading this comment instead of the chapter of a good book anyhow?) I think we can all agree that Koopa i̶s̶ ̶a̶ ̶c̶u̶l̶t̶u̶r̶e̶l̶e̶s̶s̶ ̶b̶a̶r̶b̶a̶r̶i̶a̶n̶ mainly wanted to provocate. PS: 1984 is not science fiction. The most technical advanced thing they have are cameras. So unless you would call a story about webcam striptease sci-fi, 1984 is not. As someone who appears to be passionate on the topic of books, I'd like to point out that Ludwig has made a stance on why the phrase, "Go read a book," is a flawed response. ...Yeah, that statement was hyperlinked to an article where I actually explain what it means, which Nandin reprovided in that comment. 1984 is considered science fiction according to Wikipedia. It goes a lot into how technology can shape a future. I've done that. The article you linked talks about how book are not automatically better than other mediums, which is a different thing than saying: books are made obsolete by the internet. And while I agree that something is not better just because you write it in a book (I actually think 99% of books are garbage), I DO think literature, that is worthy of the label, is capable of being more solemn and meaningful, than films and video games, no matter how artsy, can hope to achieve. Furthermore it takes more concentration and calm to read a book than play a video game - so it is, ideally, an act of slowing down and reflecting: something which films and especially video games have a harder time realizing, due to the very nature of their respective mediums. Oh reading 'books are obsolete' reminds me of one of the best books there is: Fahrenheit 541; so it only makes sense to close my answer with an excerpt. PS: While 1984 is casually called science fiction on Wikipedia, research in the topic suggests that this is controversial and literary fiction may be the better word, since the technology is incidental in the novel. Full disclosure on my part: I didn't skim what the Go Read a Book Is Flawed article actually covered until right now. That said, it implicitly makes my point: If books aren't better than anything else, and anything else is more accessible, then wot good are books? You might be interested in wot Hideo Kojima, the auteur of artsy games, has to say in terms of achievement-hoping. He thinks all forms of media will end up converging. I will dispute that it "takes more concentration" to read a book than play a game, because one of the best things that games have going for them is that they are great at getting people into the ULTRA-CONCENTRATED flow state, much better than books are. I guess you could say that, since books are less likely to get someone in flow than games, then to get through a book is more commendable because you need to constantly have discipline rather than letting an out-of-body experience do it for you. ...But that's also like trying to get pity points for using a typewriter instead of a desktop to write a paper. One of the most amusing meta things about Fahrenheit 541 is that it's the book most people start using resources like SparkNotes for. I will say, however, that, in a way from your quote, Fahreinheit 541 agrees with me regarding how it's a problem that STEM education is pushing out the other important stuff like English and history and stuff. I agree with pushing back against the cultural rot, but I also don't think that books are a good symbol to rally behind. I would say that the technology in 1984 is on a tier higher than "incidental." It's enabling. Wouldn't be possible without it. It sure didn't exist at the time of writing. It's basically Panopticon stuff. Normally I agree that Pearl is cuter than Marina, but what the hell she's a space alien here that's not cute. The ending of the cross-over is similar to the ending of the second Professor Layton game, PL and the Diabolical Box, but I'd say the former was far more outlandish. The second game has both a 'vampire' and a town that is not what it seems. However, the plot twists are certainly more believable even if they are a little ridiculous. Despite it's flaws, Diabolical Box still holds up today and is probably my third favorite game in the series. Because I'm fan of the crazy plot twists in the series, I have to choose Team science-fiction. Well, I approve of vampires, but I find the plot twists a disaster, especially the one in the crossover that is not believable at all. Shouldn't Team Fantasy have a lot to go against Layton crazy plot twists? I admit that all of the games have fantasy elements, especially in the prequel trilogy where there is an actual living mummy. I should have clarified by saying one of the biggest plot twists in the series is found in the third game, Unwound Future. The plot is focused on time-travel, a sci-fi theme. It's my favorite in the series and that is why I chose sci-fi over fantasy. Well, answer this: Wot makes the Layton series the determining factor? Which would you say HORRORists are generally allied with? Either, really. Supernatural horror is closer to fantasy, but there's plenty of science fiction horror out there, too. Also, I forgot to comment on the Professor Layton stuff. The thing with Professor Layton is that the writers love to set up a supernatural or otherwise impossible situation and have him reveal the "logical" answer, but the logical answer is always more ridiculous than the original premise. This usually works out well enough, except in two cases (in my opinion): Diabolical Box and the crossover. DB is my least favorite game in the series because of its twist, which is somewhat similar to the crossover's twist. In both cases, they created too many questions and plot holes for me to suspend my disbelief enough. Hmph, alright, don't wanna make a blanket statement. Well, Kody was saying the same thing in the comment thread right above this about how Diabolical Box is similar to the crossover in terms of explanations, but I guess he liked it a lot more. Right, it's a genre that can have shades of either. The ending of Diabolical Box made me furious. I'm nowhere near as favorable toward it as he is. to take away from the rest of the game's great atmospheres, music, puzzles, and features that would be carried on into future games. I mean, just about every ending is illogical and unrealistic when you think about it. (A dinosaur fighting a robot forms a perfect shadow that looks exactly like a specter?!) When I play the games, I go into them with a suspension of disbelief and enjoy them knowing even if there are some ridiculous twists. I feel like I'm better off not knowing what the ending actually is. The ending of the game really does not have much bearing on the rest of the games, so you do not miss much if you have not played it. Overall, I would say that I enjoy DB more than Ace Attorney: Justice For All except for perhaps case 4. On the contrary, I enjoy the first Ace Attorney game more than the first Professor Layton game while I like the third game of each series equally. I just felt like it created too many plot holes, more so than the other endings, which is the same problem I had with the crossover's ending. Oh, that's why all your comments are unrelated to the articles. Hasn't it already been confirmed that I don't read these things unless they're remotely interesting? Yeah, but you never clarified how you determine if they're remotely interesting. Internet-wide research already says that people don't even read blogs, but they just skim them, so I'm interested in feedback in how to get people to read things. The title catches my eye. Could you give examples of good titles and bad titles on this site? Some title with Zelda/Pokemon in it is good. I think you're confusing the way the title is written with the subject of the article. The article after this has an interesting title. REMINDER THAT TEAM SCIENCE FICTION LOST.